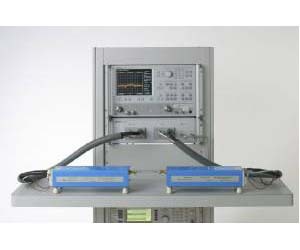 The ME7808B Broadband Vector Network Analyzer (VNA) is a high performance measurement solution that covers 40 MHz to 110 GHz in a single fast sweep. Built on the advanced technology of the Anritsu Lightning 65 GHz VNA, the ME7808B is ideal for making accurate S-parameter measurements of components and devices to 110 GHz. The flexible system architecture of the ME7808B makes it easy to adapt to multiple measurement applications. An alternate configuration is the ME7808B Millimeter Wave VNA, a high performance measurement solution that covers specific millimeter wave bands from 50 GHz to 325 GHz. Any of the two-port Lightning VNA models can be used as the foundation for the Millimeter Wave VNA.